Reports of President-elect Trump’s nomination of Representative Cathy McMorris Rodgers to head the U.S. Department of the Interior have drawn outrage and concern from conservation groups and public trust advocates. McMorris Rodgers has served as U.S. Representative for the state of Washington's 5th congressional district that includes Spokane and the eastern third of the state. The five-term Republican is chair of the House GOP Conference and is vice chair of Trump’s transition team. The New York Times first reported news of her expected nomination. McMorris Rogers is beholden to the oil and gas, timber industry and other corporate interests - and seeks to open federal land and waters to fracking and other fossil fuel development, according to environmental groups. She received $109,600 from the oil and gas industry and $83,950 from the forestry and forest products industry in 2016, according to Open Secrets. bit.ly/..
She is strongly opposed to the removal of Snake River dams to restore salmon and steelhead in the Pacific Northwest, a campaign that is backed by Tribes, recreational and commercial fishing groups and environmental organizations. Since the election, President-elect Donald Trump's has appointed corporate agribusiness advocates, oil industry shills and other anti-environmental politicians to his transition team and nominated them for key cabinet posts. The nomination of McMorris Rodgers to the Secretary of Interior position poses an enormous threat to the fish and wildlife populations and the river, lake, bay and ocean waters of California and the nation, according to conservationists. “Americans should be deeply concerned by the nomination of Rep. Cathy McMorris Rodgers to lead the Department of the Interior She has a troubling track record of actively undermining our environment. The Secretary of the Interior is charged with stewardship of most of our nation’s public lands, including national parks and wildlife refuges. The person who fills this role sets the tone for relationships with tribal governments and bears crucial responsibility for protecting wildlife, including endangered species. Congresswoman McMorris Rodgers’s environmental record is frankly terrible. She has repeatedly voted against the environment and in favor of special interests who want to use public lands and resources for private gain. She has supported rollbacks to critical environmental protections for our nation’s forests, voted to undercut the president’s authority to protect public lands as national monuments in Western states, and voted against restricting taxpayer hand-outs to companies that profit from oil and gas extracted from federal public lands. On wildlife, McMorris Rodgers has stood in the way of species recovery. She has co-sponsored legislation to remove all federal protections for the endangered gray wolf. She is also one of the most vocal opponents of restoring the lower Snake River, long highlighted by biologists as the most promising tool for recovering endangered wild salmon populations in the Pacific Northwest. Her congressional voting record shows lots of evidence that McMorris Rodgers will serve the interests of corporations that seek to plunder resources from public lands, rather than acting on behalf of all Americans to safeguard our wild lands and natural treasures. “President-elect Trump’s choice of Cathy McMorris Rodgers for Secretary of the Interior raises concerns about what kind of Interior Secretary she will be and her commitment to conserving our rivers, clean water supplies, wild salmon and our nation’s priceless natural heritage,” said Irvin. Irvin pointed out the contrast between legislation weakening protections for rivers and fish that she authored over the past two years — and legislation that she worked with American Rivers on in 2013. 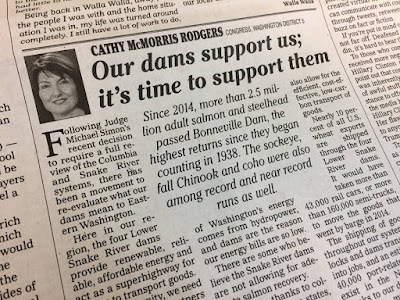 “Over the past two years, Rep. McMorris Rodgers authored and championed legislation to roll back protections at hydropower dams, weakening safeguards for clean water, fish and wildlife and public lands, and undermining the protection of tribal lands in hydroelectric dam relicensing proceedings. 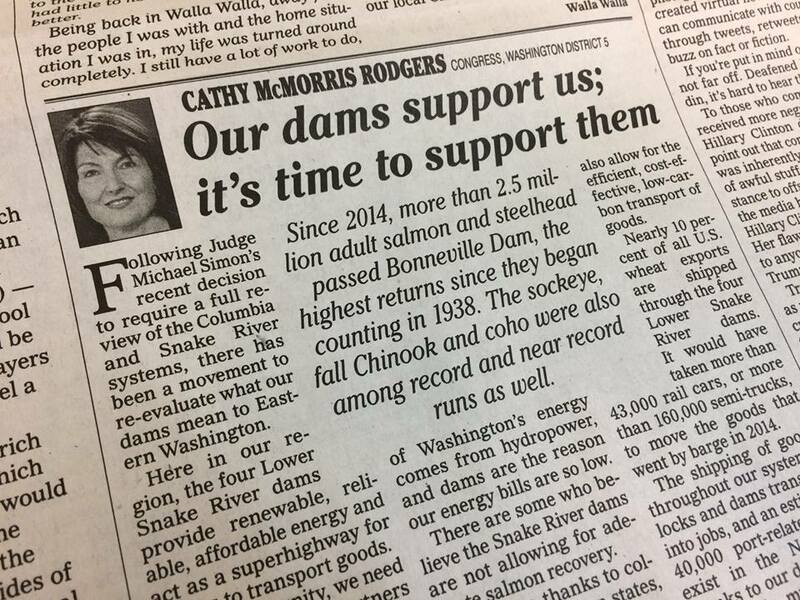 By contrast, in 2013 Rep. McMorris Rodgers worked with American Rivers on successful legislation to promote hydropower without undermining bedrock environmental laws like the Clean Water Act. We hope that, if confirmed as Interior Secretary, she will return to that approach and work for the conservation interests of the American people, not just the interests of large energy companies,” said Irvin. “Important river restoration and water supply agreements such as those on the Klamath, San Joaquin, Yakima and Colorado are at stake, along with the health of thousands of miles of rivers and streams nationwide. With drought gripping western states, wild salmon runs on the brink of extinction in the Columbia and Snake rivers, and climate change threatening local communities and economies nationwide, we need a Secretary of the Interior who will prioritize restoration, protection and stewardship of our nation’s natural resources,” Irvin stated. Mark Trahant: Will salmon recovery continue if dams are not removed? Lets review some of the appointments in key environmental positions by President Elect Donald Trump to date, in light of Trump’s nomination of McMorris-Rodgers for Interior Secretary. On November 11, Trump appointed Representative Devin Nunes (CA-22), one of the most aggressive Congressional proponents of increasing Delta water exports to agribusiness and opponents of fish and wildlife restoration in California and the West, to the 16-member executive committee of the transition team. On November 21, Trump named Doug Domenech, the director of a pro-Big-Oil think tank, to lead his Interior Department advisory group. Domenech is director of the Fueling Freedom Project, a subsidiary of the right wing Texas Public Policy Foundation, an organization heavily funded by the billionaire Koch brothers and ExxonMobil. Domenech replaced David Bernhardt, a lawyer and Westlands Water District lobbyist who co-chaired the natural resources department at the firm Brownstein Hyatt Farber Schreck and served as a George W. Bush Interior Department official, as the head of the Interior Department team. Bernhart represented the Westlands Water District on litigation involving the Delta and the Endangered Species Act. On December 7, Trump announced Scott Pruitt, the Oklahoma Attorney General, as his pick to head the Environmental Protection Agency, “Pruitt has fought and sued the EPA to protect industry interests, and now he’s poised to lead the agency,” said Katy Kiefer, Campaign Manager for Food & Water Watch. Trump also met on December 6 with Rex Tillerson, CEO of ExxonMobil, to consider him for Secretary of State. “One of the biggest frackers in the business, Exxon not only knew about climate change nearly 40 years ago, but has spent millions to mislead the public on the most critical environmental crisis of our time,” said Kiefer. If people think that the capture of the regulatory apparatus by the regulated has been bad under Obama, it will undoubtedly become even worse under the Trump administration. You can expect McMorris Rodgers, Representative Devin Nunes, Scott Pruitt, Rex Tillerson, Tom Pyle and other Trump transition team appointees and nominees for administration posts to fiercely oppose the restoration of salmon and steelhead populations in the Sacramento-San Joaquin River Delta, the Klamath and Trinity rivers, the Snake River and other river systems. Delta advocates also worry that if the Obama administration doesn’t terminate the California Water Fix before President Obama leaves office, Governor Jerry Brown may make a deal with incoming President Donald Trump to weaken the Clean Water Act and Endangered Species Act in order to fast-track the construction of the Delta Tunnels. The California WaterFix is based on the absurd contention that taking up to 9,000 cubic feet per second of water from the Sacramento River at the new points of diversion, as requested in the petition by the Department of Water Resources (DWR) and the U.S. Bureau of Reclamation to the State Water Resources Control Board, will somehow “restore” the Delta ecosystem.